Three palaeotropical genera of large, fruit-feeding nymphalids. 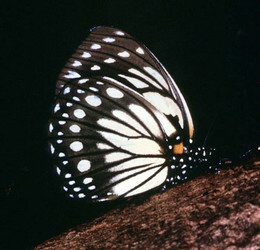 Larvae have "horns" on the head capsule and bifid "tails" like those of Satyrinae. The recent molecular analysis of Aduse-Poku et al. 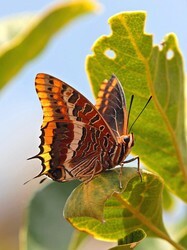 (2009) implies quite strongly that Charaxes is paraphyletic with respect to both Euxanthe and Polyura. However, the latter two genera are clearly monophyletic. The list of species included here below the link to Charaxes are those species that have not been sampled in the phylogenetic studies upon which the tree is based or assigned to a species group by the cited authors. They ARE part of Charaxes, but are listed here because including them within Charaxes makes Charaxes and Charaxini equivalent groups and collapses the tribe, due to the apparent paraphyly of the former. Page: Tree of Life Charaxini Guenée 1865. Authored by Niklas Wahlberg and Andrew V. Z. Brower. The TEXT of this page is licensed under the Creative Commons Attribution License - Version 3.0. Note that images and other media featured on this page are each governed by their own license, and they may or may not be available for reuse. Click on an image or a media link to access the media data window, which provides the relevant licensing information. For the general terms and conditions of ToL material reuse and redistribution, please see the Tree of Life Copyright Policies.